Assemblies that are organized to bring together people in a particular neighborhood, city, town, or constituency in order to develop community governance and determine shared work. Assemblies that are organized to bring together people who work on a similar frontline of struggle to share analysis, collaborate, and consolidate action plans. 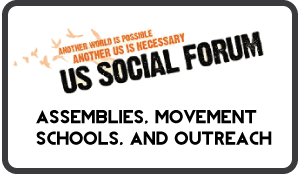 Assemblies that are organized to represent front-lines and communities in order to provide a vehicle for social movement governance. 2. Create an organizing committee. Determine the focus and goals for the assembly. What key issues are being experienced that need to be organized around? Develop a clear and common understanding of the purpose of the assembly and build trust with each other. Gather skilled and experience facilitators to conduct the meeting and design the agenda with others who are invited into the process. Collectively think through the current political moment and how it impacts local issues. Discuss potential opportunities for movement building that might come out of the assembly. Determine the length and location of the PMA. A PMA can be 2 hours, a full day, or a few days of gathering together. Allocate enough time in the small groups for resolutions to be generated. Be sure that the location is accessible (transportation, physical space, signage, room setup, language, dietary considerations, etc.) and has space for childcare. Create a clear agenda with coherent flow. Create opportunities for those involved to understand, be engaged, and feel a sense of ownership in the process. 3. Provide Training & Preparation for small group facilitators. 1. What is the purpose of facilitation? Think about the goals of the different parts of the agenda and decide what kind of facilitation to use for each section. CONTENT DRIVEN: Focus on content when the goal of facilitation is to share knowledge, ideas, and skills. PROCESS DRIVEN: Focus on process when the goal of facilitation is to build relationships and teams. DECISION DRIVEN: Focus on decisions when the goal of facilitation is to determine coordinated actions and common platforms. *All three approaches can be used at different times throughout the assembly. 2. What are the political guidelines used to move the assembly process forward? Think about the people who will be coming to the assembly and organizations they are associated with. Do they have guidelines by which they operate? We will prioritize the voices and experiences of people most affected. We will be aware of time and space that we are, or are not, taking up. We will recognize that oppression exists and not allow it in our space. We will assume that multiple strategies exist and are appropriate. 3. What is your individual style and technique? Develop your style and technique to suit the needs of participants and to reflect your political principles. 4. 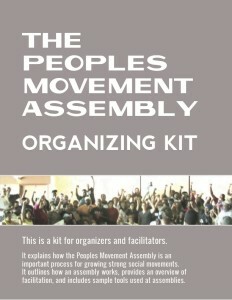 Organize people to participate in the Assembly. Communicate broadly about the opportunity for convergence with people, groups, and organizations. Communicate with as many people coming as possible about what they can expect from the Assembly and what they should prepare. SPIRITUAL / CULTURAL LEADERS: Convene, bless space, and set tone. SMALL GROUP FACILITATORS: Support small group discussions. NOTE TAKERS / VIDEOGRAPHERS: Document assembly and ensure documentation is given to organizers. RESOLUTION WORKING GROUPS (if applicable) : Finalize writing of resolutions after assembly. SPEAKERS: Provide historical, political, and social contexts. SYNTHESIS: Actively track, categorize, and synthesize the content and discussions to produce representative statements and plans of action. *Individuals can play multiple roles.